Brew Your Coffee Over Ice This Summer! Lately, I have become a huge fan of coffee! :) But with the hot weather this summer, a HOT beverage doesn't always seem that appealing. So how do I still get my coffee fix??? ICED COFFEE with my new Keurig and Brew Over Ice Varieties! Before I received some great Brew Over Ice varieties for review from Keurig, I had never tried to make ice beverages with my Keurig because I usually prefer hot. But just when I thought my Keurig experience couldn’t get any better…I was introduced to the Brew Over Ice K-Cup® and now I love my Keurig® brewer even more! Now I can relax and rejuvenate with a wide variety of refreshing, cold beverages, brewed at the touch of a button. Brew Over Ice packs are uniquely blended, with just the right amount of coffee, tea or fruit, to ensure a refreshingly cool brew every time. Look for the Brew Over Ice seal on your favorite brands: Green Mountain Coffee®, Celestial Seasonings®, The Original Donut Shop™, Vitamin Burst™ and much, much more. And my favorite part: It is just as Easy to Brew as hot beverages! Chilling out has never been this easy. Step 1: Fill a 16-oz. 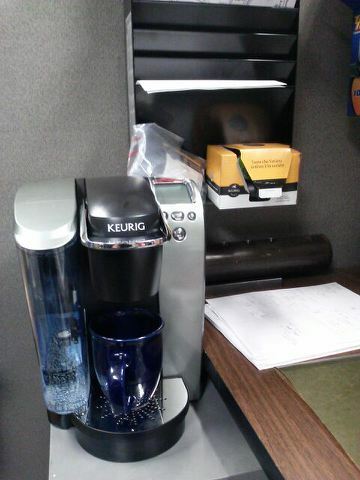 cup (Do not use glass) to the top with ice and place a Brew Over Ice K-Cup® pack in your brewer. This summer I am still enjoying my cup of coffee every morning...but now it is brewed over ice with my awesome Keurig and the delicious variety of Brew Over Ice cups! Buy It: You can purchase all Brew Over Ice varieties online or at a local retail store near you like Walmart, Target, and so many more! I love ice coffees. This is one of my favorite thirst quenchers during summer.